Roast the carrots: Arrange the carrots on a roasting pan, and drizzle with olive oil. Sprinkle salt, pepper, and cumin seeds. Roast the carrots for 20 minutes – allow to cool for 5 minutes, then add to the food processor. Prepare the purée: Saute the shallots for 1 few minutes, until fragrant – add the apples, and sauté for an additional 4 to 5 minutes. Add the turmeric, salt, and pepper – add the stock, and bring the mixture to a boil – lower the heat, and allow the mixture to simmer for 10 minutes. Remove from the heat, and allow to cool for 5 minutes – add to the bowl with the carrots, and process until smooth. Keep the purée warm while preparing the fish. 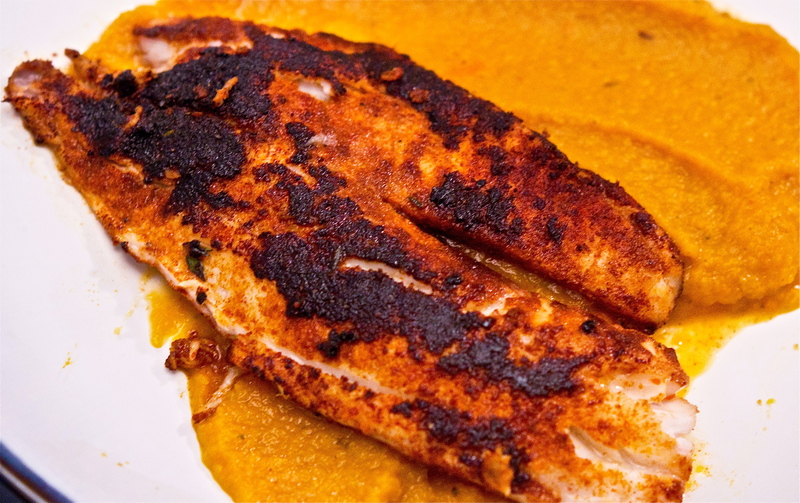 Prepare the tilapia: Add the paprika, cumin, and thyme to a small bowl and stir to combine – pour the rub onto a plate, and set aside. Pat the fillets dry with a paper towel, then dredge the fish (one by one) into the rub, coating completely. Allow to sit for 15 minutes. Heat a large skillet (preferably cast iron or stainless steel) over medium heat – add the oil, and heat until just smoking. Lower the heat slightly, and add three fish to the pan – don’t touch or move the fillets for at least 3 minutes (this will give you the blackened look). Flip onto the other side, and place a lid on the pan. Allow to cook for about 4 minutes (or until done – it should flake easily with a fork, with no translucent parts). Remove the fish from the pan and tend with foil to keep warm. Repeat the process for the remaining fillets. For plating: Add a heap of purée to each plate, and top with one fillet – add a squeeze of lemon, and serve immediately.